I am still getting settled in, but off to a good start on my assignment to Shenzhen, China. Once things settle down I hope to resume postings in more regular fashion. 1) I Love to Travel - this assignment is a rare opportunity for me to explore Asia for significantly less than otherwise possible being based in the US. 2) Reduced Expenses -by having my employer cover my living expenses, I am able to reduce my daily expenses and save a greater portion of my income. 3) Its A Good Career Move - this assignment continues focus on building my career (and hence my income) which has been an objective of mine for the past couple of years. I realized in 2003 on a business trip to this area that I needed to be here. The tremendous growth and energy from this area of the world is unlike anything I have ever experienced. I suppose it is a bit like the "Wild West". I felt compelled to come here and be a part of it. I have been doing a student exchange to Hong Kong last fall and it was great. 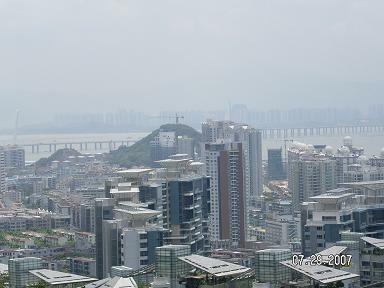 Have also been to Shenzen, nice city! Shanghai is the absolute best, Beijing a bit boring IMO (too much an administrative city). Conclusion: You'll have the time of your life over there! Good luck! Good luck, sounds like a great opportunity. I hear the RE over there is going crazy as well. Perhaps get some inside scoop on some China stocks? Good Luck! Hope everything settles itself quickly and the assignment starts of well. Good luck on your assignment. I remember living out of the country for a year, and it was great. It was still an English speaking country, though, so you have a lot more fun ahead of you! Congrats and welcome to China! That smoke above the city looks absolutely ugly. I wonder how´s peoble health issues raise in these fully smoked chinese cities.